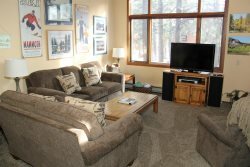 Nice One Bedroom & Loft & 2 Bath Condominium in town near the Sierra Star Golf Course and the shuttle route to the Eagle Lodge Express Ski Lift Area in Mammoth Lakes. Sleeps up to 6. Second Story unit with 2 levels The Master Bedroom has 1 Queen Bed and the Loft has 2 Full Beds and 1 Twin Bed. 2 TV's, Large Flat Screen in the Living Room and a regular TV Bedroom. WIFI Internet Access. New tile in the bathrooms and nice newly installed doors. You walk up 1 flight of stairs (outside) to enter the unit and there are two levels...The first floor is the master bedroom, 1 full bathroom, kitchen, comfortable living room, dining room...the second floor is the loft which is open to the living room by a half wall and second bathroom. There are 2 outside parking spaces available. There is a game room with a billiard table, a ping pong table and a video game in the lobby of the Sunshine Village condos. In the summer you have access to BBQ areas throughout the complex and a Tennis Court near the swimming pool at Sunshine Village. Coin-operated laundry facilities located in the common area near the office. TOT LICENSE 3390-SV134. Great place to stay for a few days of ski at Mammoth. Apartment was very comfortable, well equipped and location is conveniently close to free bus routes. Furniture is a bit outdated but comfortable and in good shape. Weve had an excellent stay and will book the condo again in the future. I enjoyed the stay very much, swimming and playing table tennis with my kids. A nice unit at Sunshine Village. The Shuttle to Eagle runs at a short walk to the street. Inside, the furnishings are comfortable but a bit dated. The kitchen is well stocked with utensils. Parking is an issue and tight. The second night we had to park around the corner from our unit but not far. Access to Eagle and the Vons shopping center are easy and relatively close. We would stay here again. Very nice place in a great location!